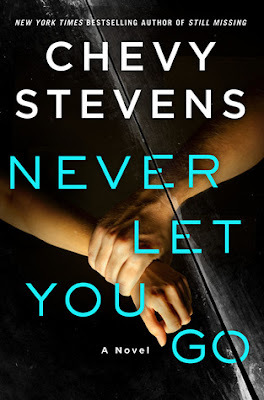 I love Chevy Stevens's novels and Never Let You Go was excellent. Her novels are always page turners that I just can't put down so I couldn't wait for a free weekend where I could lose myself in the story. Lindsey thought she had the perfect man when she married Andrew. However, the honeymoon doesn't last long as Andrew's true colors start to show. Soon Lindsey has no friends and is under constant surveillance by her husband. He has also indebted her family to him and she is too ashamed to confide in them anyways. But she has a young daughter to think about. Will he hurt her? The story is told in alternating past/present, with the present chapters alternating between Lindsey and her now 17-year-old daughter Sophie and the reader learns what actually transpired between Lindsey and Andrew the fateful night she fled with her young daughter. But in present day, not all is rosy and I was paranoid right alongside Lindsey about every male character in their lives as someone is clearly playing mind games with her. Is it her ex-husband who was recently released from prison or Sophie's new boyfriend who seems a little too slick. There's Lindsey's boyfriend who wants things to get to get more serious and the former therapist turned self-defense coach added to the mix. Even the cop that responds to the possible break-in at Lindsey's housecleaning client acts a little suspicious. I was a bundle of nerves, in the most delicious way, throughout the story. Now there were two instances where I thought I might not be able to continue with the story. There are two dogs. You can torture, maim, and kill any human character in a story and I can make it through, but harm an animal and I can't continue. If you are like me, just know that no animals were seriously harmed. So if you are looking for a great thriller where you are turning the pages while peeking between your fingers, then Never Let You Go is a must read. I can't wait to read this. Thanks for a great review. I hope you enjoy it. I think it will be one of my favorite novels this year.